My research at Cape Otway has not come to an end, but rather expanded into a broader project on the ecology and management of southern koalas. To that end, I will not be continuing this blog, but have finally created a website where you can stay up-to-date on southern koalas: https://victoriankoalaresearch.wordpress.com. I have not blogged since January. 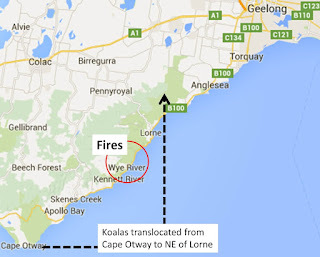 Sadly, this reflects the lack of blog-worthy news about Cape Otway’s koalas. The government’s plan to address the problems at the Cape has met with partial success. Most of the radio collared koalas that were translocated in September have survived which leads us to hope that the 300+ koalas translocated through to December also have prospered in their new home. However, tree condition at Cape Otway continues to decline under the feeding pressure of ~1000 koalas and other than inserting some hormone implants into a small proportion of the female population (most of which would have already had pouch young), the government has not taken any more action. And there don't appear to be any plans to. It is frustrating to sit by and watch Cape Otway manna gum woodlands continue to decline in condition. It is concerning that there don’t appear to be any plans for more translocations. Fertility control is a long-term approach for reducing population density and will not reduce the current unsustainable browsing pressure on trees. Data collected by our February Earthwatch team showed that tree condition in many sites is critically poor. I expect further declines by our next data collection in September and November. On the positive side, it is awesome to see the local landholders and the Conservation Ecology Centre actively planting trees, but of course, this also is a long-term approach. Plenty of females with young in February. 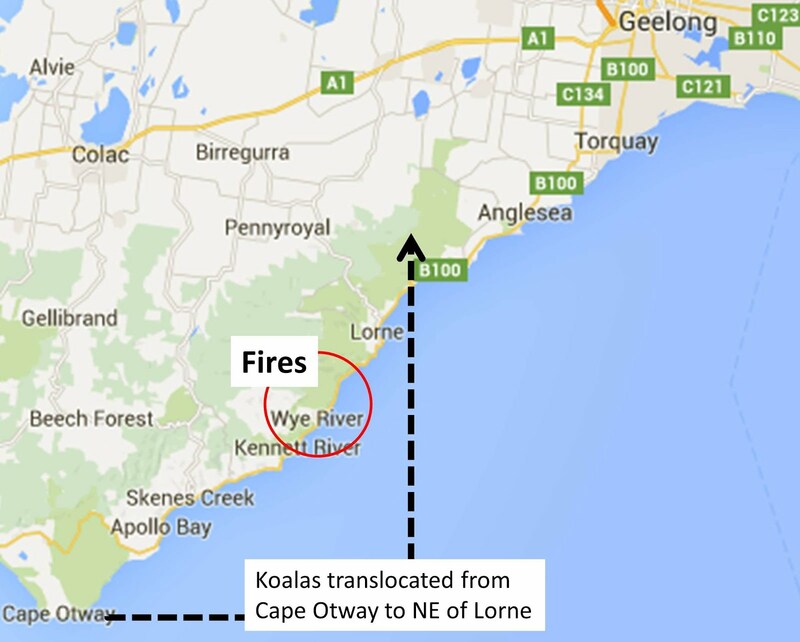 So, what does this mean for the future of koala research at Cape Otway? Sadly, the Cape has become a difficult place for field research. I will continue to undertake some monitoring at our long-term sites, but it is no longer possible for me to continue the Earthwatch trips and conduct research there on koala behaviour and ecology. On a number of occasions in 2015, my research was compromised by government management actions – study animals (identified with eartags) were euthanased or given hormone implants without my being notified. I can’t take the risk that the same won’t happen again. I now have started projects in other locations. On the Mornington Peninsula, students and I are working with the local community of Somers to understand the ecology of their urban koalas. If you are interested in learning more about that project, please join our facebook group https://www.facebook.com/groups/MPKoalas/. We have radio collared some koalas there and have been fascinated to see how widely they roam. Other projects (and students) are considering southern koala populations and threats more broadly. In many locations, koala populations appear to be declining. We need to gain a better understanding of those situations. Tracks of one of our boys in Somers. Translocating koalas always will be a risky business. Although many of the risks can be mitigated through careful choice of animals and translocation site, it is impossible to make accurate long-term predictions of extreme weather events, and where lightning may strike and cause out-of-control wildfires. We can't hold decision-makers responsible for these events and how they affect translocated animals. 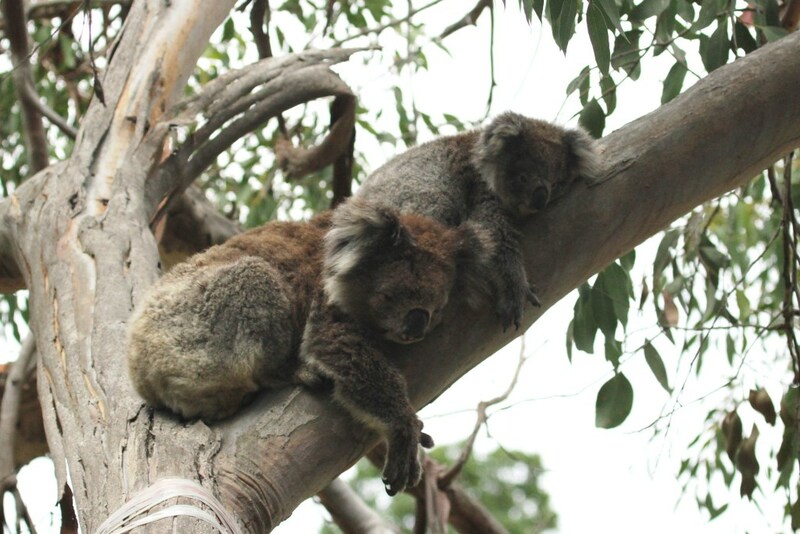 In the case of the Cape Otway koala translocations, DELWP did their best to time the program and select a release site that would give translocated koalas the best chance of survival. They now also have implemented a monitoring program which addresses one of my earlier concerns about their program (see my last blog). In Victoria, there is always potential for extremely hot weather in December and January but I don’t think anyone could have predicted the severity of the heatwave that hit Victoria in late December 2015. This weather undoubtedly would have affected survival of the 400 koalas translocated from Cape Otway in Nov/Dec but also would have affected survival of those remaining at Cape Otway too. As for fire, neither Cape Otway nor the area where the translocated koalas were released have been affected… yet.... but, Victoria’s fire season is far from over. The Great Ocean Road fires that have been reported widely in the media were sparked by lightning strikes on the 19th December (http://news.cfa.vic.gov.au/news/lorne-fires-update). Despite hard work by CFA crews, these fires burned out of control, eventually claiming many properties in the townships of Wye River and Separation Creek. Thankfully, no human lives were lost but the impact of these fires on all wildlife (not just koalas!) will have been considerable. More heat waves and greater frequency and intensity of wildfire are increasing threats to the conservation of many wildlife species. Research already has indicated that koalas have poor tolerance for dry, hot conditions and in parts of Queensland where heatwaves are becoming more common and last longer, koalas are disappearing. Although our current focus in southern Australia is managing the impacts of high-density koala populations, we should not forget that many of our koala populations are threatened by warming climates and therefore must consider how we can manage these populations more effectively too. Two weeks ago, the government started translocating koalas from Cape Otway to a location somewhere near Lorne. I have observed this with mixed and somewhat uneasy feelings. Translocation is the only way to rapidly reduce the Cape Otway koala population and give some koalas and trees a chance, but is it too late? And what is the cost to the translocated koalas and habitat at the release site? Unfortunately, we will never really know the answer to those last two questions. While it is correct that the government conducted a trial translocation of 37 koalas, at the time of making the decision to translocate hundreds more, only about half of those 37 koalas had been found and their health reassessed. And, it was only four weeks after they'd been moved. Research suggests that the effects of chronic stress associated with translocation may not be seen for at least three months. Furthermore, no females with back young were included in the trial group yet many of the koalas being translocated now have large back young. I suspect that those back young will be abandoned by their stressed mothers. So are all these koalas just being moved to suffer a slow death out of sight? With no plans to monitor even a small sample of these animals, we will never know. The risks to the habitat in the release area also may be high. Although all female koalas will be given hormone implants to stop their future breeding, it is likely that most are already pregnant. Peak breeding activity this year occurred in late October and with around 90% of females producing young each year, if the koalas survive the translocation, they will be producing fertile young. Will this result in a koala problem at the release site? I was shocked and more than a little disappointed to learn that the government has no intention to monitor the success/failure of this translocation program beyond checking on the trial animals once every three months. Here they have a prime opportunity to learn whether this approach is effective in terms of koala welfare and risks to the release site. If they believe that this is the last time that translocation will be needed, they are being very short-sighted. So why not learn from this program? And, what of the manna gum habitat at Cape Otway? Even the removal of 400 koalas and sterilisation of others won't be enough to save habitat in the long-term. More translocation and significantly more effort to catch and sterilise female koalas will be needed, and even then, it is probably too late for many trees. Will this joey and ones like it survive translocation? Without monitoring, we will never know. Culling koalas? Who would dare suggest such a thing? Interestingly enough, some Queensland and New South Wales researchers have just published a paper suggesting that koalas be culled. Not just any koalas though; just those that are suffering terminal effects of Chlamydia and transmitting this disease to healthy koalas. 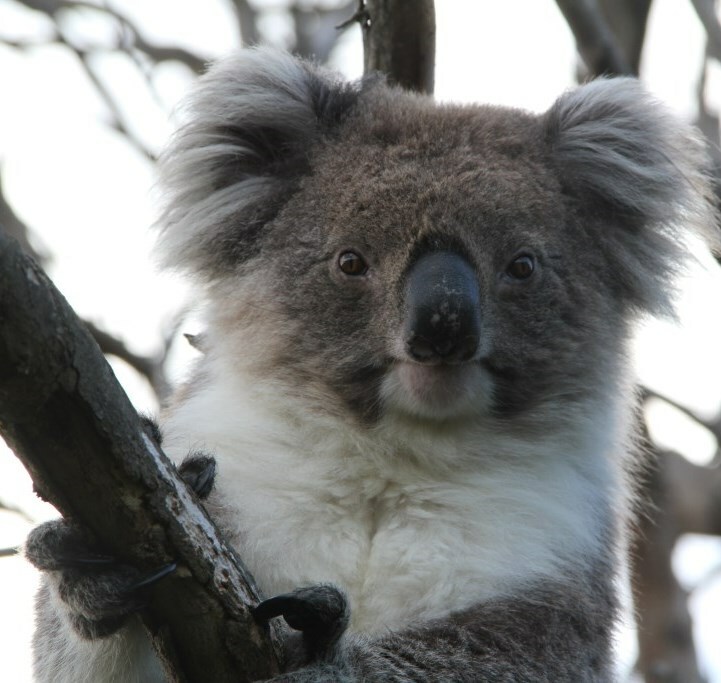 Using computer simulations, they showed that this 'selective culling' approach would result in an increase in population size in 'The Koala Coast' population in Queensland as a result of reduced disease incidence. Not surprisingly, their suggestion resulted in a little confusion in the media. Afterall, it wasn't that long ago that everyone was upset about 'culling' starving and extremely ill koalas at Cape Otway. Today, I published an article about 'culling' koalas in The Conversation (http://theconversation.com/a-cull-could-help-save-koalas-from-chlamydia-if-we-allowed-it-49195). In short, I believe that culling should be available for managing koalas whether it be for disease management OR to address overabundance issues. 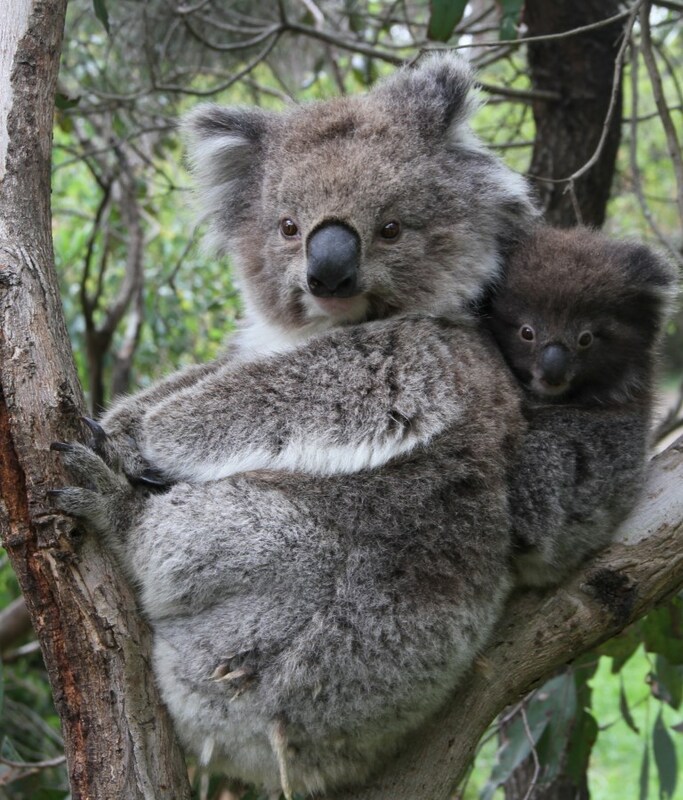 The current 'no culling' policy has resulted in many koalas at Cape Otway suffering slow deaths due to starvation. Watching koalas die like this is horrific to witness. Although the thought of 'culling' healthy koalas doesn't entirely sit well with me (I love these animals), I would much prefer to see a few culled than to see an entire population suffer and a unique ecosystem disappear. This is not to say that 'culling' should be used indiscriminately though. It should only be used when other approaches fail or aren't viable. Governments need to be more proactive in assessing management options in advance of problems occurring. If that had happened at Cape Otway, the population needing management would have been much smaller, fewer animals would have been affected, and a crisis situation averted. Thanks to the generosity of Wildlife Acoustics, we will soon be eavesdropping on koala conversations. Wildlife Acoustics has provided me with some Songmeters that I will be deploying in a number of sites in the Otways. Songmeters are recorders that can be programmed to record whenever you want them to. These ones will be programmed to remotely record for 5 minutes per hour for up to a month, and capture the 'song' of any koalas vocalising at the time. Queensland researchers already have shown that systematic recordings can be used to determine the timing of the breeding season. Our project will build on that by examining if there is a relationship between the frequency of bellows in recordings and the density of koalas (from visual surveys) in a site. If we find that there is a relationship, using Songmeter recorders may be a less time-consuming and more systematic way of monitoring koala populations throughout Victoria. Many thanks to Wildlife Acoustics for supporting our research! To translocate or not to translocate? This is a question that is currently in the spotlight. it is likely that translocated koalas will have a high probability of survival. The better option would be for governments to implement long-term management actions (fertility control and habitat management) prior to emergency situations arising. That advice was ignored for Cape Otway so unfortunately, translocation of koalas is now the only option for saving some of our manna gum woodlands and all of the wildlife it supports. It also may be the only option for avoiding more koala starvation and more koala euthanasia. Will there be any impacts of translocated koalas on the receiving habitat (including the resident koala population)? For example, koalas should not be translocated to areas like South Gippsland where koalas have more diverse genetics or to areas where there is a high incidence of disease. Translocation has been a component of other long-term koala management programs. While working on the Kangaroo Island Koala Management Program, colleagues and I conducted research trials out of concern for the welfare of koalas being translocated to the south-east of mainland South Australia. We radio collared a number of koalas that were surgically-sterilised and translocated, and also radio collared some surgically-sterilised koalas remaining on the Island. If you are interested in the full details of our study, we published the results in The Journal of Wildlife Management (Whisson et al. 2012. 'Translocation of overabundant species: Implications for translocated individuals', http://onlinelibrary.wiley.com/doi/10.1002/jwmg.401/abstract). We observed low mortality in the first three months following translocation but 37.5% translocated koalas were dead after 12 months compared to none in the control group that remained on the island. Translocated koalas moved greater distances than those that remained on the island. Some individuals moved up to 10km within the first three months post-translocation. Clearly, translocated koalas were negatively impacted and this is why I believe that translocation should be a last-resort action only. An 'acceptable' level of mortality also should be decided on prior to large-scale translocations occurring. So what about translocation of koalas in Victoria? Obviously koalas can survive translocation (most koala populations in Victoria have resulted from koalas translocated from island populations) but under what conditions and how many koalas survive the process? Surprisingly, despite the tens of thousands of koalas that have been translocated in Victoria over the years, to my knowledge there only have been a few studies of koala survival and the results appear only in draft reports. In some cases mortality has been high (around 90% translocated koalas dying) and this is why the government has been reluctant to use the approach for management of koalas at Cape Otway. However, the reasons for such high mortality in some translocations aren't clear. Is it that koalas can't adapt to new food sources (when moved from manna gum to other forest types), or is it that they have been stressed by their treatment (surgical or hormone implant), or are they being moved to unsuitable habitat? Hopefully some of these questions will be answered by the current trial being conducted by the government, and that the koalas in the trial survive. I also hope that the government learns from this situation and develops long-term management strategies for koalas and their habitats to avoid having to use translocation as a last-resort management tool.